AYDEN, NC – It’s an unassuming spot just off Highway 11 outside of Greenville, N.C., but inside is a third generation culinary tradition and a James Beard Foundation Award. You may already know the Skylight Inn and its reputation for the best whole hog BBQ, but owner Sam Jones gave us a backyard tour of this eastern N.C. institution. Meals are humble and legendary here. A simple tray of chopped pork BBQ, dotted with crispy skin, reveal the whole hog origin of your vinegary- smokey treat. Paired it with crispy cool slaw and a slab of dense cornbread, the meat stands out in a state where BBQ is a spiritual journey. A glass bottle of Cheerwine or Pepsi from a Yeti cooler on the counter washes it all down. Part of the fun is watching how your supper companions assemble each bite; some layer it on a bite-size piece of cornbread, others use the bread to scoop slaw and pork out of each tray, to ensure a proper slaw to meat ratio. 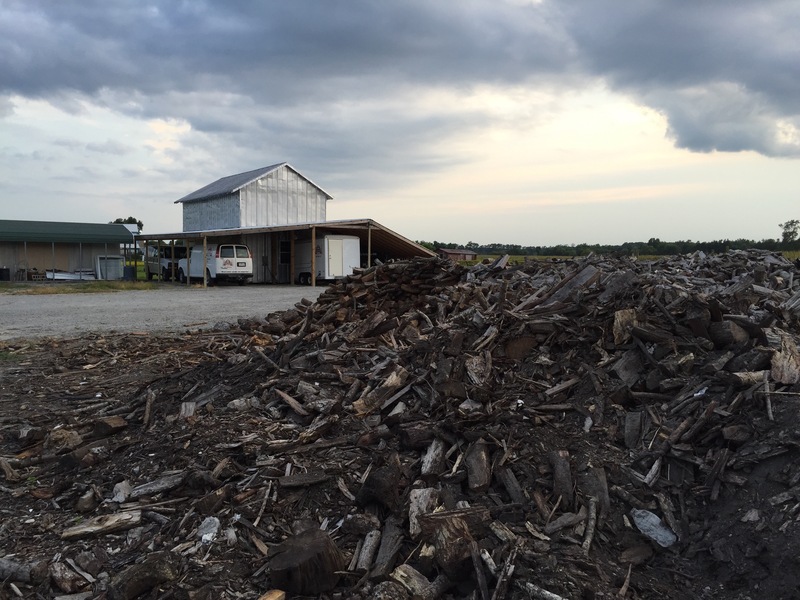 Backstage, the smokehouse and immense piles of firewood have produced a down-east culinary tradition long before farm-to-table was cool. 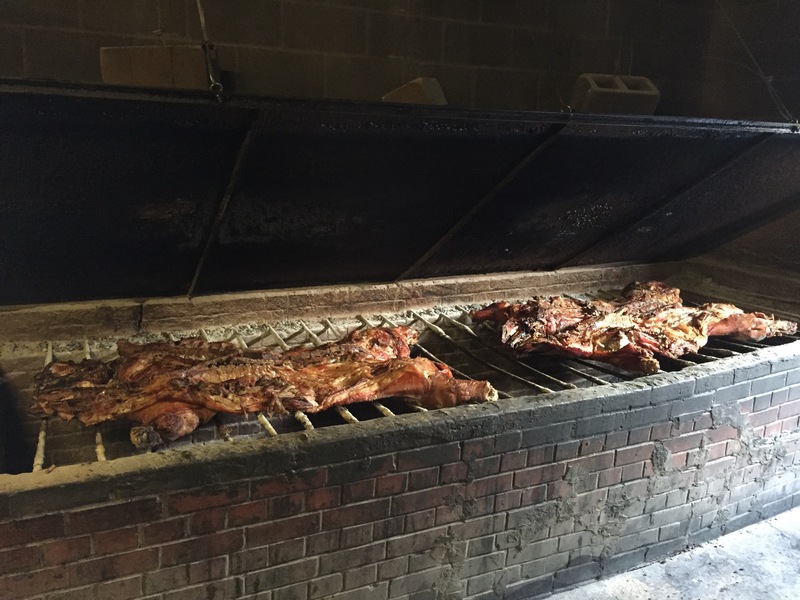 Here, 180 pound hogs are smoked in huge brick pits over slabs of burning oak. Jones said they try to get dirt-raised (AKA free-range) hogs whenever they can, but he’s acutely aware of the need to keep BBQ an affordable, accessible tradition. In 2001 Sam Jones took over the family business started by his grandfather, Pete Jones, in 1947. When his grandfather had a heart attack he put Sam in charge. He was 21 years old and a student at ECU. It wasn’t what he pictured for his future after years of working in the restaurant. That epiphany came quietly to Jones. When he first took over their challenge was proving that the Skylight Inn could survive without his grandfather at the helm. He was invited to cook at the Charleston Food and Wine Festival shortly after taking over. It was the first time anyone at the family business had cooked off site. He was hooked, it was now a way of life. In 2003, shortly after The Skylight Inn ventured into foodie circles, the phone in the back of the restaurant rang. Jones’ father took a message from a New York woman calling about the James Beard Award, an award voted on by more than 600 culinary peers around the country. It’s often called “the Oscars” of food. She invited Jones to New York to accept the honor. Decked out in a tuxedo, Jones took the stage and accepted the “American Classics” James Beard Award, joining the ranks of classically trained chefs around the country. His subtle sense of humor, North Carolina manners and thick accent charmed the New York crowd. He made the rounds at the after parties, returning to his hotel at 4 a.m. It was quite an introduction to the national culinary stage. “When you get an award like that, suddenly you’re the belle of the ball, everyone wants to talk to you,” he said. Now Jones is part of the crowd, traveling around the country, proselytizing North Carolina BBQ culture. He and chefs from all over formed a group called the Fatback Collective, using their talents to put on high-dollar fundraising dinners across the south, raising hundreds of thousands of dollars for charity at each event. After three generations, Jones is gearing up to open a second restaurant. Sam Jones Barbeque in Greenville is slated to fire up the pits later this year with an expanded menu. He may not hear the applause everyday when he carries out the plates, but The Skylight Inn’s sweet, smokey song will now be in stereo in eastern North Carolina. In recent years cupcakes have taken over as one of the newest food trends. From little ones to big ones, lots of icing to barely any, these miniature cakes are dominating the sweet-treats game. 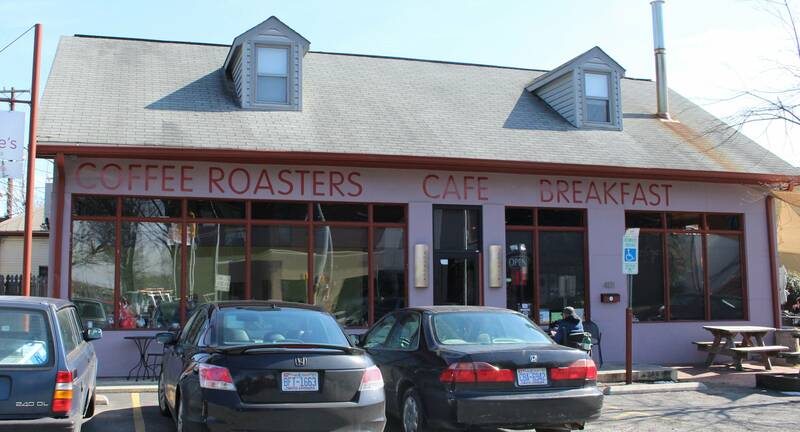 If you find yourself in the Triangle and have a hankering for one, you’re in luck. The area has a wide variety of cupcake-focused bakeries. Cupcakes are the perfect way to celebrate a high school or a college graduation. 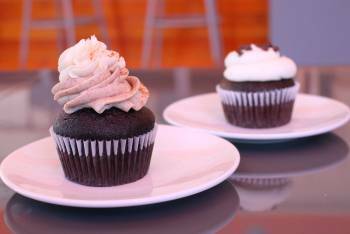 Three especially noteworthy cupcake havens are Gigi’s Cupcakes, The Cupcake Bar and Sugarland. Each of these bakeries will do a delightful job pleasing your taste buds with their desserts. Gigi’s Cupcakes is one of the newer bakeries to Chapel Hill, but is one of the most widely known. With about forty locations nationwide, Gigi’s can safely say they know their stuff when it comes to cupcakes. They pride themselves on providing a family-friendly atmosphere and delicious treats. Before customers get a chance to eat anything they are sure to get hit by the sweet-smelling aroma of freshly baked cupcakes. Believe it or not, they taste even better than they smell. So, if you’re on Franklin Street with your kids anytime soon, make sure to stop by Gigi’s for dessert. The Cupcake Bar is one of the gems of Bull City. This bakery’s claim to fame is its cocktail inspired cupcakes. In addition to more traditional flavors, The Cupcake Bar has treats such as “Citrus Cooler” and “Strawberry Daiquiri.” The bakery was opened by two sisters in 2008 and has a very special charm to it. Even better, The Cupcake Bar makes its miniature cakes with natural and locally grown ingredients. This bakery is the perfect place to stop by during a day out in Durham. Sugarland is a Chapel Hill favorite, especially amongst UNC students. Their “Half-Priced Tuesdays,” during which all of their cupcakes are half off, are very popular. However, what really makes Sugarland unique is their full bar and their professionally trained bakers. Sugarland is great for grabbing dessert and drinks with friends after a show or a movie. If that’s not enough, the cupcakes themselves are phenomenal. Between the filling, icing, cake and garnishes, Suagrland’s cupcakes often times take multiple recipes to make. The bakery offers a classy cupcake option that you are sure to enjoy. I’ve driven by Capital Club 16 many times but it always looked too fancy to go for dinner without an occasion. But one of my friends had a going-away party there, so it was a good excuse to dress up and go out for dinner to “Cap Club.” We started off with the Pimento Cheese and Fig Crostinis. I am not usually a fan of Pimento Cheese but with the figs, the dish was just the right amount of creamy and smoky. 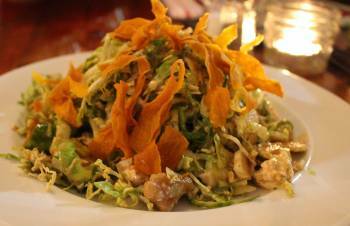 I ordered the shaved brussel sprout and frisee salad with local blue cheese and sweet potatoes. I loved the texture of the shaved brussel sprouts and the crunchy strips on top. The salad and the harvest quinoa made for a healthy and filling meal. 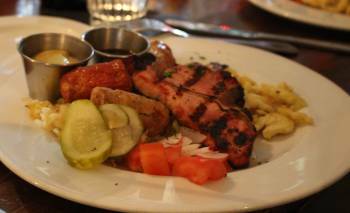 Some more adventurous eaters in our party ordered the butcher plate: grilled artisinal sausages, smoked pork chop and seared pork belly with sauerkraut, spaetzle and gravy. At $20, this dish seems like a great deal for meat eaters, however I just admired it from afar. 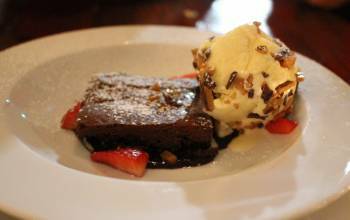 For dessert, we got the brownie sundae – can’t go wrong with that! Capital Club is one of Raleigh’s fine dining gems without the snobbery that can tend to go along with fine dining. Maybe it was the dynamic group I went with, or the great food, but I know I’ll be back – they have so many vegetarian options I’d like to try; the portobello grilled cheese sandwich sounds like a winner. Enjoy your dining experience at “Cap Club,” and be sure to let me know your favorites. It’s that time of the year…college seniors are getting ready to graduate and move on to the next phase of their lives. The most important part of graduation? Where you take your family to eat, obviously. 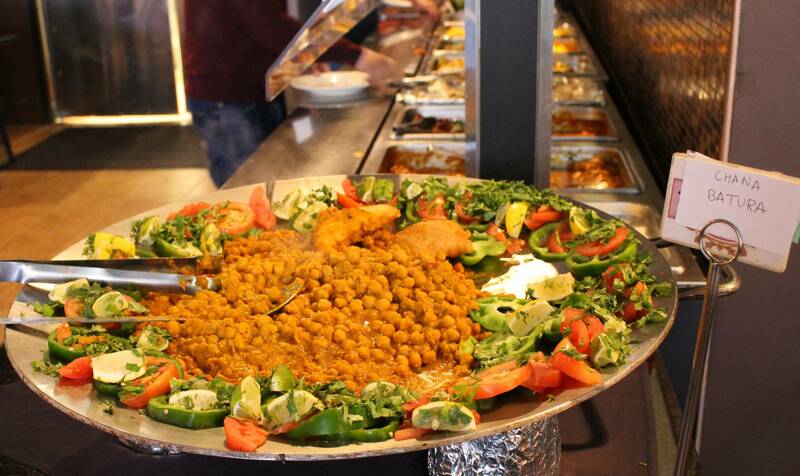 Friday night, your family arrives, hungry and ready to eat – where do you take them? Then there is Saturday lunch, dinner and Sunday brunch. So much to eat in so little time! Take your out-of-town family to get an authentic dish of chicken and waffles at Dame’s in Durham. Dame’s has a laid-back, casual atmosphere and a delicious selection of chicken and waffle creations, including choices of sweet potato waffles and vegan waffles. Looking for something more elegant? If you didn’t already make a reservation, it may be hard to get into Elaine’s on Franklin, but if you can get a reservation, enjoy a refined, scratch-made meal in this Chapel Hill establishment. The menu at Elaine’s revolves around the best local ingredients available, so it is constantly changing but consistently exquisite. The Pit serves North Carolina barbecue in a fun atmosphere, but be sure to book a reservation because this is a popular restaurant and tends to get busy on weekends. Ranging from North Carolina pork barbecue to turkey barbecue and a selection of scrumptious sides (mac and cheese, black eyed peas, sweet potato fries…the list goes on), The Pit has something for everyone. 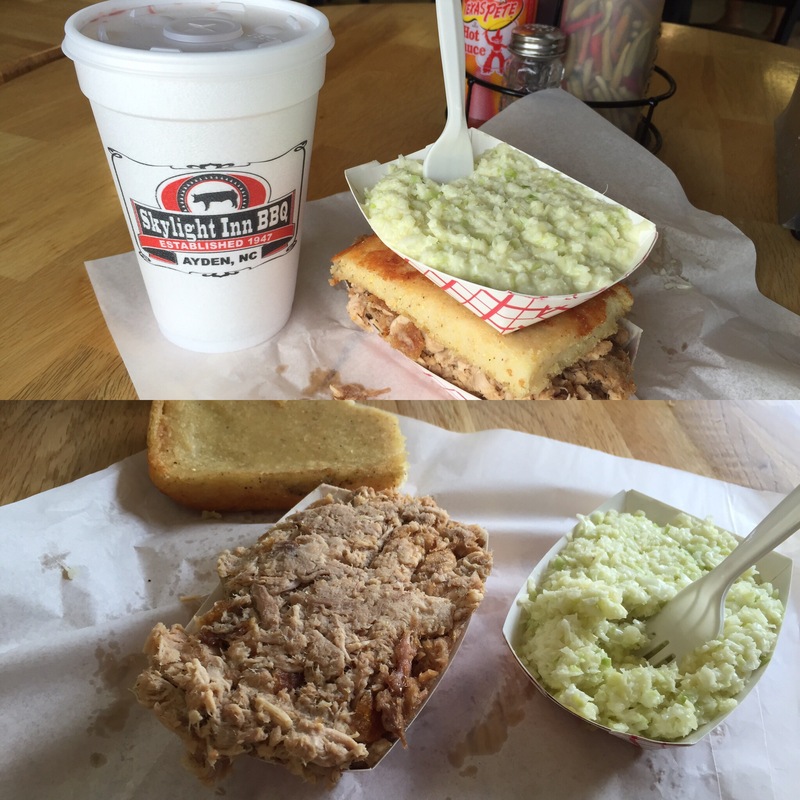 Another good option is Watt’s Grocery in Durham, a distinctively North Carolina restaurant. With items ranging from Bourbon Brined Pork Loin to Seafood Gumbo, Watt’s serves southern food just right. The menu is limited and I have only been to Watt’s for brunch, which was fantastic. I would love to try their lunch and dinner menus as well. Acme is another North Carolina restaurant that is good for dinner and Sunday brunch. If you go for Sunday brunch, expect a wait. The coffee cake and beignets (if they have them) are delicious ways to start out your brunch. 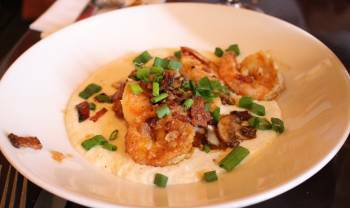 If you are a UNC graduate, and you can’t make a reservation at a Chapel Hill restaurant, try Acme in Carrboro – you will be pleasantly surprised! 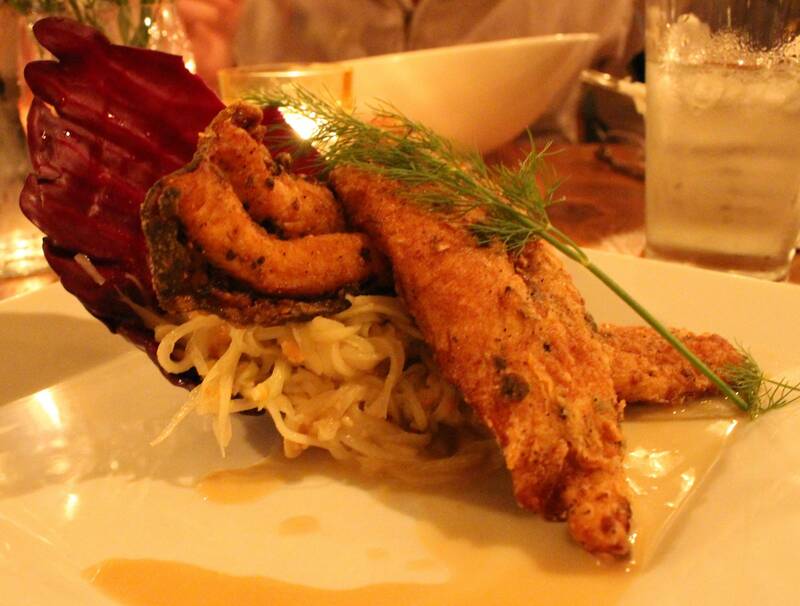 I had a great dining experience at Venable in Carrboro, serving local food since May 2012. As a relatively new restaurant, Venable is a good place to take your family if they are from North Carolina. Venable serves dinner and brunch as well as a late night menu. The Chèvre Salad and the local fish selection make for quite a tasty dinner. Another option is Bida Manda, a fairly new Laotian restaurant in downtown Raleigh. 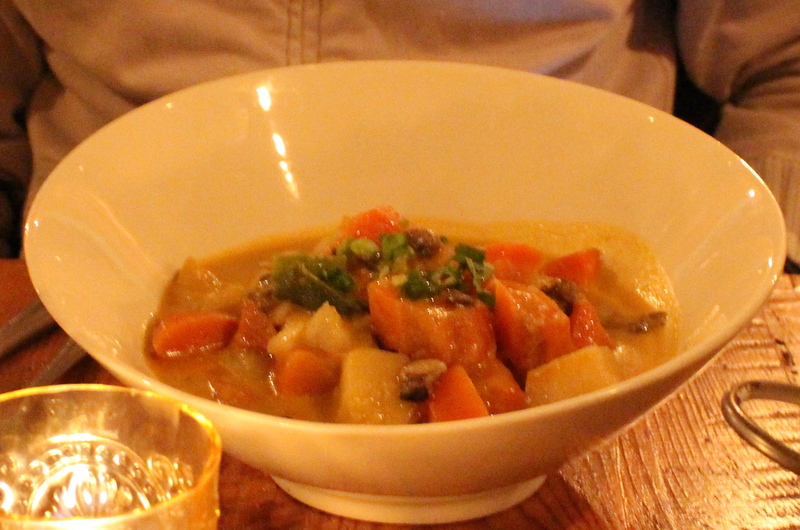 You will need a reservation for Bida Manda; since it’s opening, Bida Manda has taken the Triangle food scene by storm. With authentic Laotian tastes and North Carolina decor, this is a perfect place for a nice dinner on Saturday night with your family. The Lantern is an Asian fusion restaurant: Asian flavors made with North Carolina ingredients. Since its opening in 2002, Lantern and its chef/owner Andrea Reusing have won awards in “America’s Top 50 Restaurants” and “best farm-to-table restaurants” categories. Sometimes, it’s easier to order in since restaurants tend to fill up quickly around graduation time. One of my favorite casual lunch restaurants in the Triangle is Neal’s Deli. 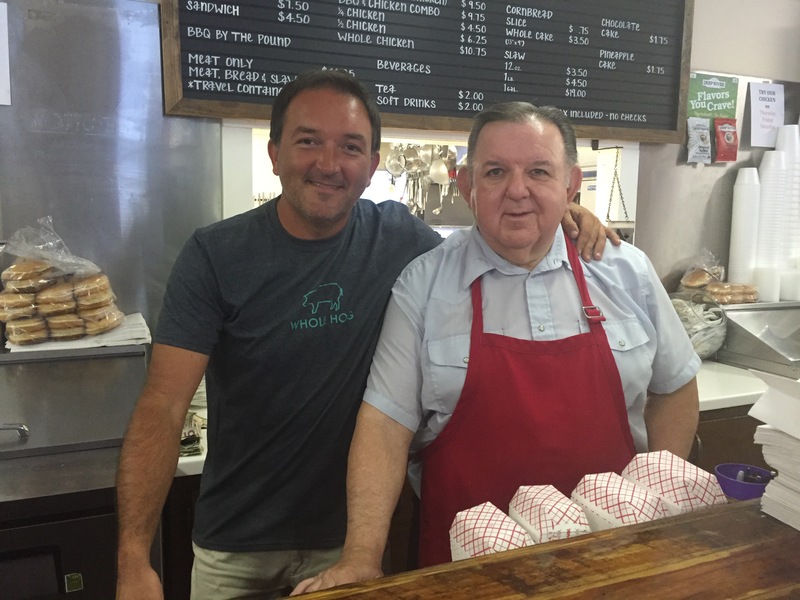 Neal’s is a family business and uses local ingredients to create simple yet tasty deli sandwiches. Check out their catering menu here. Nantucket Grill and Bar offers an expansive catering menu. However, if you decide to cater from somewhere else, you must at least order your celebratory cakes from Nantucket. The Strawberry Shortcake and Chocolate Bliss are two of my favorites. Nantucket has locations in Chapel Hill, Durham and Raleigh. If you can’t get into Watt’s or Acme, don’t worry – there are plenty of brunch options in the Triangle. Big Ed’s City Market is a Raleigh establishment, serving fresh local eggs and house-made hotcakes since the 1980s. When I was a student at UNC, I loved going to Breadman’s for brunch because I could always expect a delicious pancake that was almost larger than the plate it was served on. Breadman’s is perfect for the group who can’t agree – the restaurant serves breakfast all day along with a variety of lunch options, including sandwiches, burgers and salads. Another choice for families who can’t agree is Elmo’s Diner, with locations in Carrboro and Durham. Elmo’s makes for a good local brunch or lunch restaurant because of it’s vast options. 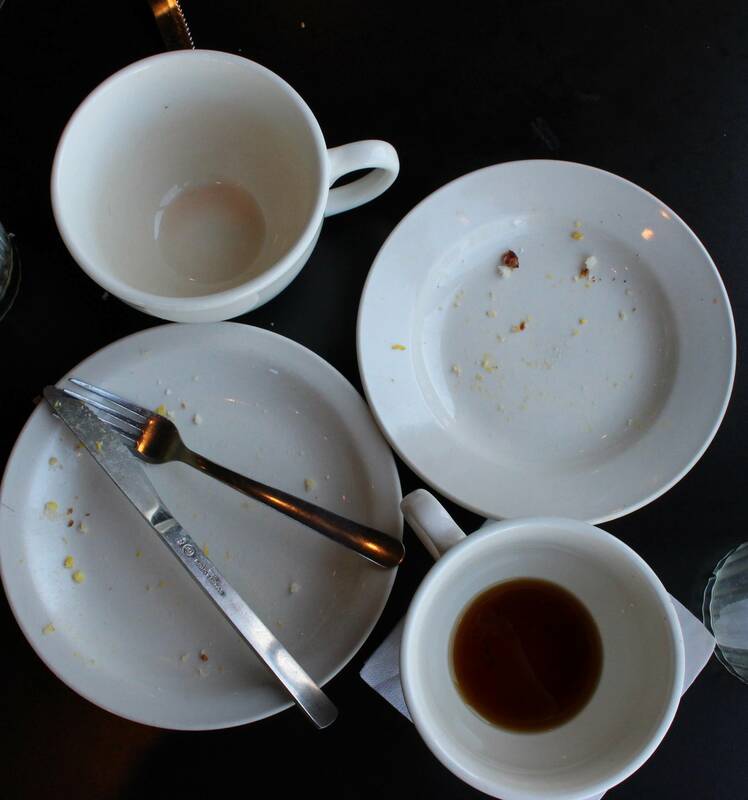 One person from your party may order an omelette, while another orders a burger and yet another person may order a large salad or a wrap. Elmo’s is also a kid-friendly environment. However, they do not take reservations, but the wait usually goes by quickly. If you don’t mind driving a little bit out of the way, Guglhupf Bakery and Cafe will satisfy your inner European with German-inspired delicacies. Guglhupf has a large outdoor seating area and an attached bakery, so you can take home some pastries. Wherever you decide to take your family, enjoy this special time with them. And congratulations! If you live in Chapel Hill or Carrboro, you’ve probably passed Jessee’s a number of times, but have you ever been inside? This gem of a coffee shop has surprisingly delicious biscuits and a welcoming atmosphere. I met my friend David here for brunch a couple weeks ago and we both ordered biscuits. I got egg and cheese and David ordered egg and bacon. If you’re not a biscuit person, the pastry case is quite tempting. I had a cinnamon roll from Jessee’s last week and it was one of the best cinnamon rolls I’ve ever had. Side note: for those non-biscuit lovers out there, these biscuits may just change your mind. Jessee’s roasts their own coffee and they have four varieties packaged for you to bring home: strong, fruity, nutty and deep roast. The coffee is great, but the barista was making a mocha for someone else and it looked so good that I will definitely be getting that next time. 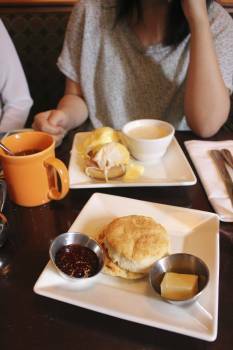 Jessee’s serves breakfast until 4:30 and they begin serving lunch at 11:30. There is a beautiful patio outside (not pictured) which sometimes hosts live bands. The coffee shop also participates in the 2nd Friday Art Walk. The only downside to Jessee’s is the lack of parking, but it is so worth it! Jessee’s partners with local business such as Maple View Farm, Ninth Street Bakery and Cliff’s Meat Market. There are no frills here; Jessee’s is a place that stays true to its roots. It’s a comfortable place to study, have brunch or get a quick cup of coffee or hot chocolate. 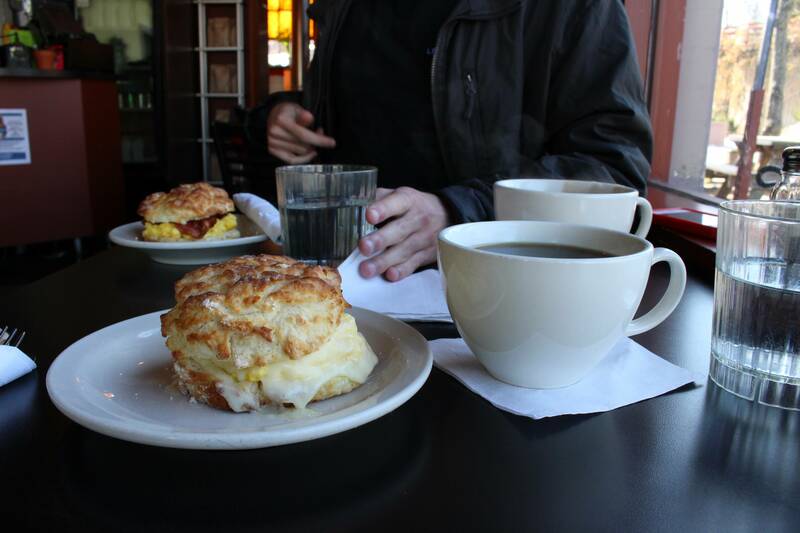 Go get yourself a fluffy biscuit at this Carrboro staple! 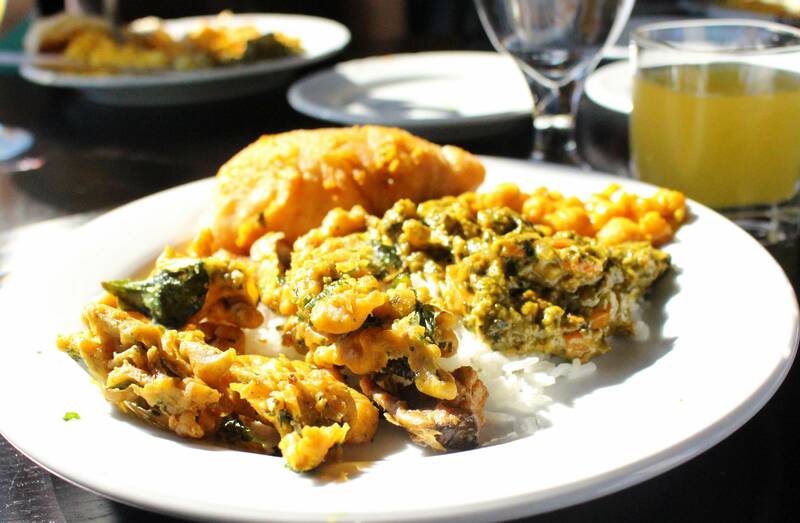 Chapel Hill has many Indian restaurants to choose from, but there is one in particular that has a great weekend brunch deal. While lunch and dinner at Mint are relatively expensive, brunch is a good deal – a $12 buffet, including bottomless mimosas. The buffet brunch, which weighs heavier on the lunch side, includes a variety of options that are both carnivore and vegetarian friendly. 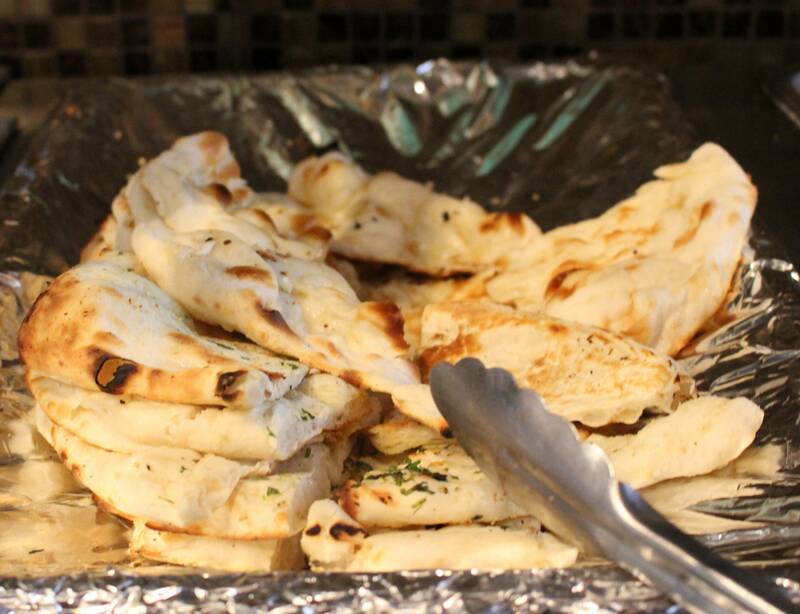 My favorites include the samosas, garlic naan and fried vegetables (a guilty pleasure that is oh so worth it). The buffet starts at noon and goes until 3 p.m., making Mint a great place to meet to catch up with friends while enjoying good food and drinks – go for the food and stay for the bottomless mimosas. A few weeks ago, my friend Liat had her birthday celebration at Kipos Greek Taverna in Chapel Hill. Owner Giorgios Bakatsias also operates Bin 54 and City Kitchen but Kipos is different from Bakatsias’ other restaurants because it reflects his family’s traditions. Kipos means “garden” in Greek and the restaurant feels like just that – a lovely indoor garden. I was equally awed by the decor as I was by the food. I was tempted to order two or three appetizers for dinner (grape leaves and vegetable fritters with yogurt sauce, anyone? ), but I went for the whole grilled fish, which was served with rice pilaf. The fish was deliciously seasoned and tender. I would definitely recommend it. Javier ordered lamb chops, which were presented in a bowl with roasted potatoes. 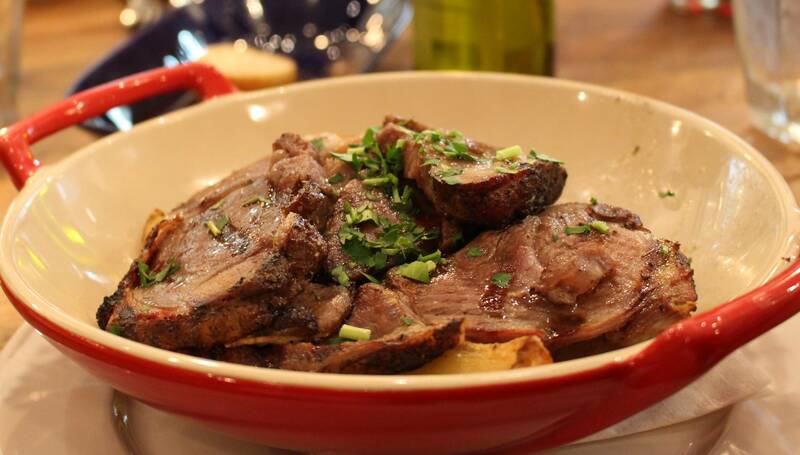 He liked the lamb more than the potatoes, but since these dishes are meant for sharing, others pitched in to help him finish. The food at Kipos was authentically Greek – Bakatsias’ sister is even the pastry chef. The environment is comfortable, casual and welcoming but the food remains top notch. 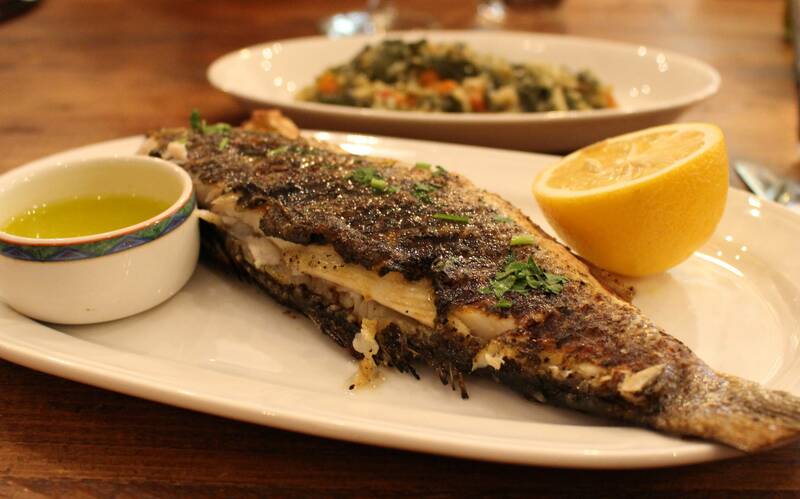 Victoria is a true connoisseur of Greek food so I recommend reading her full review here. Kipos has a large selection for vegetarians and vegans as well. 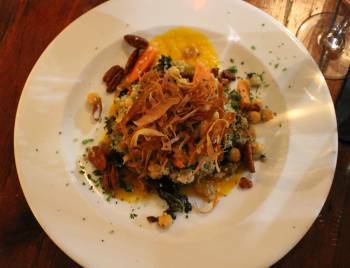 The menu is reminiscent of Bakatsias’ Greek culture and includes a variety of options. I enjoyed going with a large group so I could see what everyone’s dish looked like. A few people ordered the moussaka, a traditional Greek soufflé with beef and eggplant. The dessert selection was also tempting and I will definitely be back to try the baklava. Looking for a trophy wife or a mail-order bride? You can find both at Trophy Brewing, a small, cozy brewery and pizzeria in downtown Raleigh. According to the website, the trophy wife is “light and approachable; this beauty shows off a bright and a clean finish.” Okay, now get your mind out of the gutter. Those are beers I am talking about! I chose the Best in Show, which is an easy drinking beer with citrus undertones. This small brewery was started by the owners of Busy Bee Cafe, who teamed up with brewer Les Stewart, to create small-batch craft beers. Trophy also offers a selection of artisan pizzas made with local ingredients. 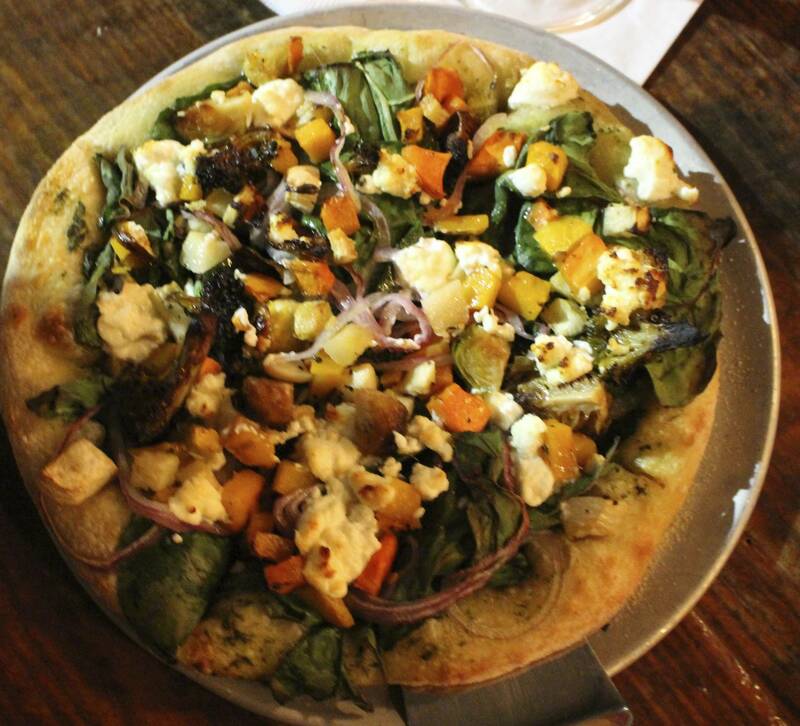 I ordered the Farmer’s Market pizza, which was full of root vegetables and goat cheese. The pizza does not normally come with goat cheese, but I highly recommend adding it. Ben ordered the Most Loyal, a pizza with roasted chicken and pesto. His also had the slightest hint of honey, which tasted surprisingly good with the pizza. Carrboro is full of hole-in-the-wall, mom-and-pop-style bargain gems. 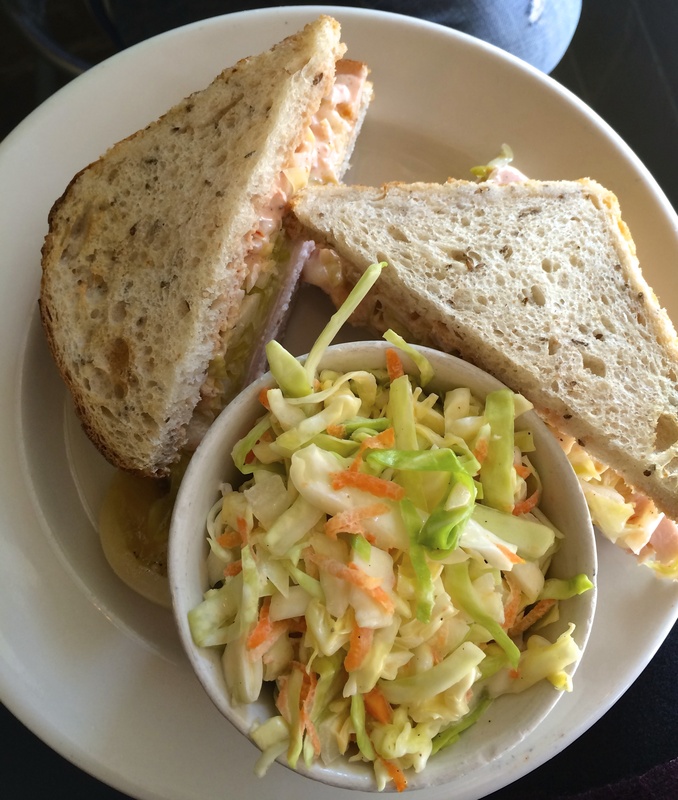 Neal’s Deli is definitely one you don’t want to miss out on. Open for breakfast and lunch Tuesday-Sunday, Neal’s Deli is your casual yet eccentric go-to spot for an authentic deli sandwich. I can’t resist a good turkey Reuben. It is the perfect item to satisfy my craving for a good deli sandwich. Neal’s Deli sources ingredients from the Carrboro Farmer’s Market. The husband and wife couple make their own pastrami and corned beef, and most of the other ingredients come from less than 50 miles away from the restaurant. You can taste the freshness with each bite. 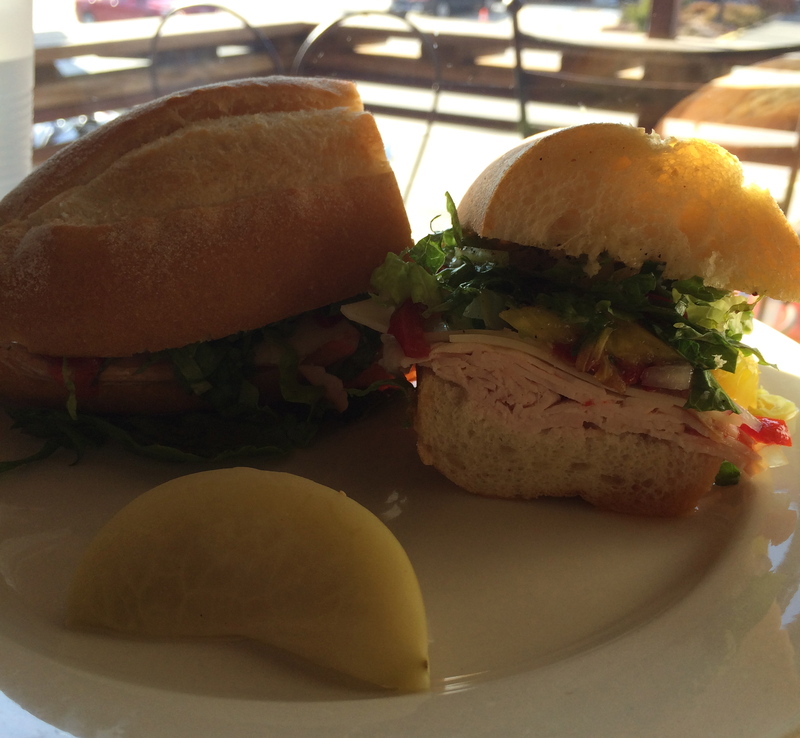 The sandwiches are carefully crafted with love. Don’t expect extra sauces or an overdose of cheese to cover up flavors here. The sandwiches are simple and delicious with just the basic ingredients. The coleslaw is fresh and not smothered with mayo – it is just right! My friend ordered the Italian sub with hot peppers. His sandwich came with a pickled green tomato – a nice touch! Neal’s Deli is also well-known for their “Brezel” roll, a buttered toasty pretzel roll, that is served with their hot dogs. The small deli on Greensboro Street in Carrboro has limited seating and the line may be long on weekends, but it is worth the wait! Neal’s Deli has garnered media attention from Food & Wine, Unique Eats, Oprah.com, and Avett Brothers’ Joe Kwon’s Taste, On Tour blog, among many. It even got a shout out in the NY Times. If you’re not already grabbing your keys and coat and heading out the door, what are you waiting for? !